We need your help! We'd love you to get out your paints, pens or pencils to design us a rocket to feature in the next educational Squeebles app! 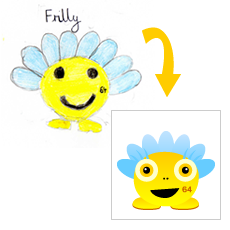 We'll be awarding a £25 Amazon voucher to the winner to share with their family or school and you'll be credited for your design within the app! The app will contain lots of different rockets designs and we'd love yours to be one of them. Here are just a few of the ones our inventors have designed so far. As you can see, you can take a couple of different approaches with your design: you can just go wild decorating the rocket so that it looks fantastic; you can draw a scene on the rocket, or you can turn your rocket into something...like Big Ben, or a strawberry milkshake. Think as wide and wild as you can and come up with something you think is fantastic and that you'd like to see in one of the Squeebles apps! 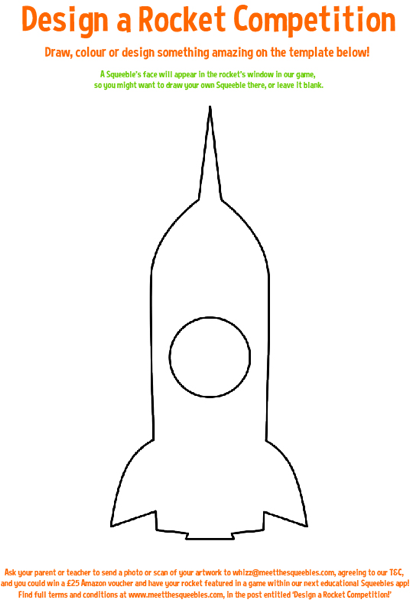 You can download a rocket template to design on here! 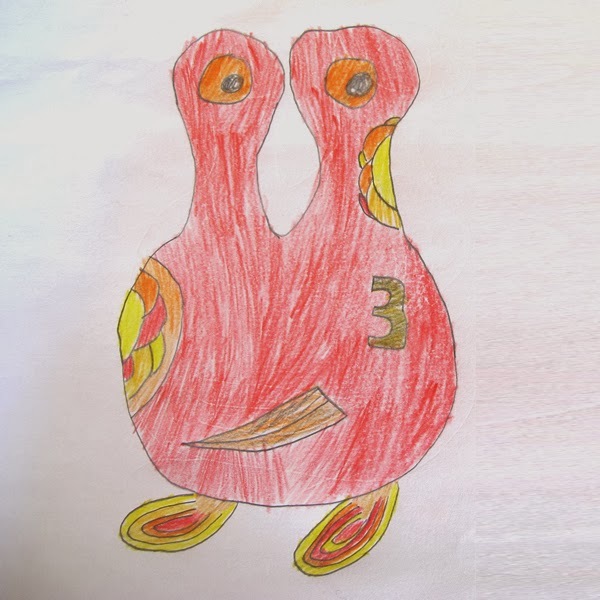 You'll need to get your skates on with this though, because our inventors are not too far off finishing the next Squeebles app and for your rocket to have a chance of being included, you'll need to get your finished design to us within the next two weeks, by midday on Monday 23rd February 2015! Please ask your parent or teacher to email a scan or photo of your design to whizz@meetthesqueebles.com, as well as asking them to read the terms and conditions below - they'll need to agree to these when they send in your entry! We can't wait to see what you come up with! We'll be announcing a winning rocket shortly after the competition closing date! Thank you so much for entering our competition! The winning rocket will be reproduced by KeyStageFun as a digital rocket in keeping with our other rockets in terms of style, but all elements of the design will be taken as faithfully as possible from the entrant's drawing. The copyright and ownership of the finished rocket we create from an entrant's design will belong to Ian & Florence Knapp / KeyStageFun. Each entrant confirms that their drawing and all associated information is their own and does not infringe anyone else's copyright in any way. Ian and Florence Knapp / KeyStageFun cannot be held responsible for any infringement of copyright unknown to them within any entry. If desired by the winner and confirmed by their parent or guardian, we are happy to credit them within the finished app as the creator of one of the rockets. The winner shall not receive any monies or benefit in any other way from the sale of any apps or other materials featuring their rocket in the future. Each entrant agrees that their rocket may be used in promotional materials produced to promote KeyStageFun in the future as well as any other apps, video content, television production, books or other written or visual materials produced for sale or promotional use in the future. By submitting an entry you agree that it may be featured on the KeyStageFun website/Facebook/Twitter or Meet the Squeebles blog (along with the entrant's first name and age if the entrant's parent or guardian gives permission for this). KeyStageFun have already created many, as yet unpublished, rockets: if one of the rockets which appears in the final app happens to be similar to an entrant's design which was not chosen as a winner, KeyStageFun cannot be held responsible for this coincidence. 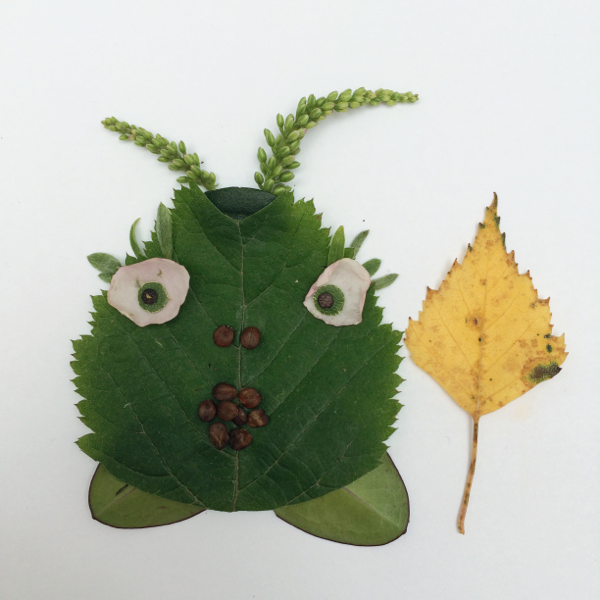 Anyway, we set our inventors a challenge: we'd like you to recreate a Squeeble from leaves! They agreed and told us that they'd make Leefee. We weren't very impressed by that, because Leafee already looks just like a leaf! Instead we challenged them to make Bitsy, who has quite a few tricky shapes, as well as some very fiddly-looking eyelashes. So, knowing that we weren't going to let them get away with making a leafy Leefee, our inventors agreed. 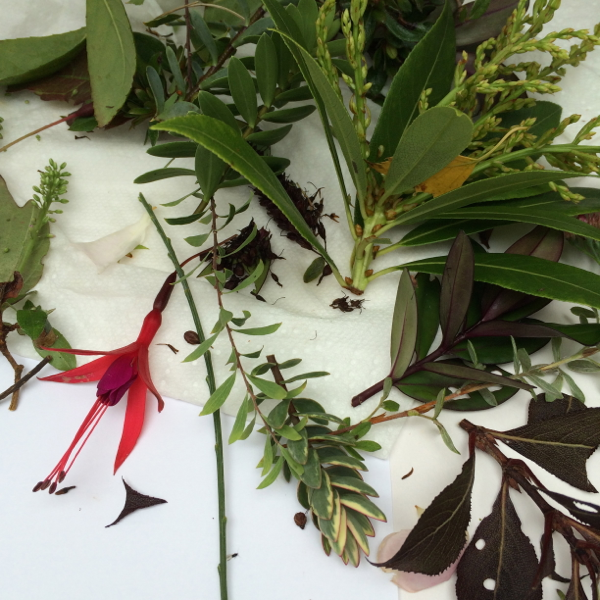 They gathered leaves when they took Nell out for a long walk one day and then found some more in their garden. They told us that they found recreating certain parts of Bitsy really tricky. 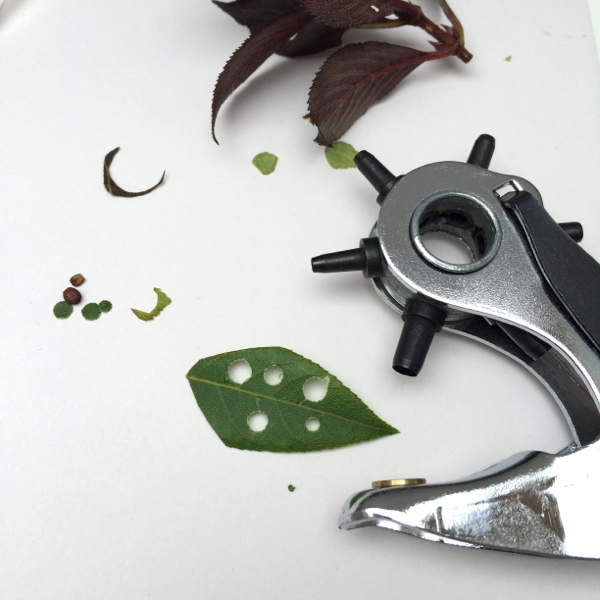 Squeebles only really look like Squeebles if they have perfectly round eyes, but they couldn't find any leaves that were just right, so eventually they decided to use a hole punch to cut circles from the leaves. 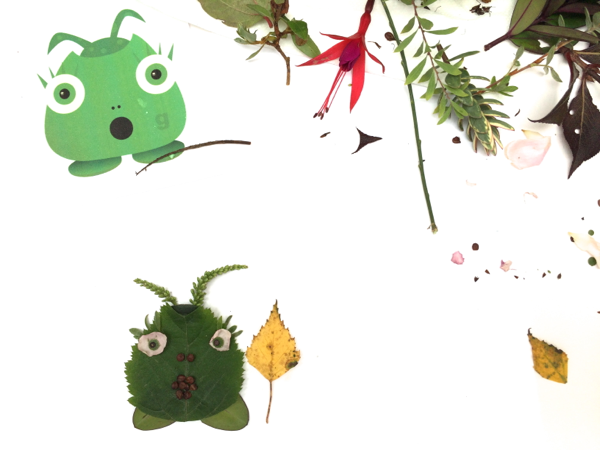 And then they arranged the leaves, seeds and rose petals they'd found, until they'd created something that looked a bit like Bitsy! We love it. 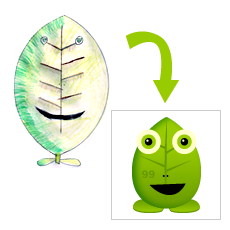 If you'd like to make a Squeeble leaf creature, but can't decide which one of us to leafify* you can find each of us on the 'Who's Who' sheet, available in the Fun Stuff section of our inventors' website. * Leafify is not actually a real word. But we think it ought to be. A New App! Squeebles Maths Race! 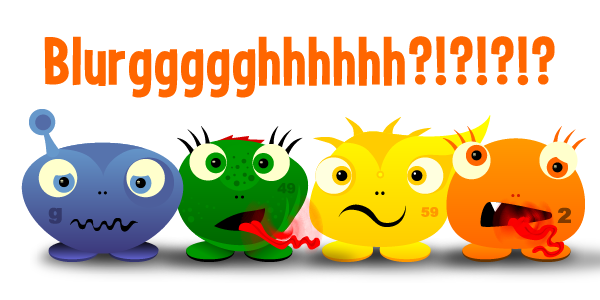 I'm so excited to tell you about the latest app featuring me and lots of my Squeebles friends! 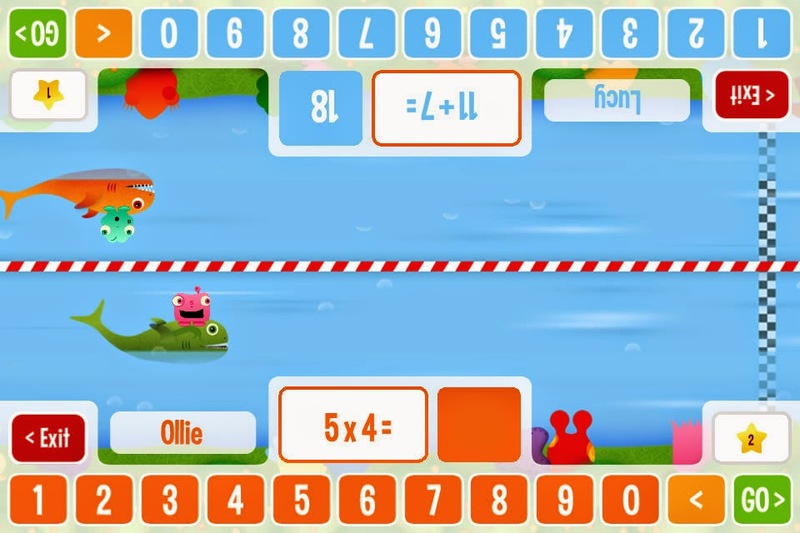 It's called Squeebles Maths Race and it's the first app that our inventors have ever made where two children can play on it at exactly the same time! This is how the screen will look when you're playing against a friend or a brother or sister - you can sit on opposite sides of the screen from one another, eyes down, fingers ready to move at lightening speed as you prepare to race your flipflish through the Rushing River! 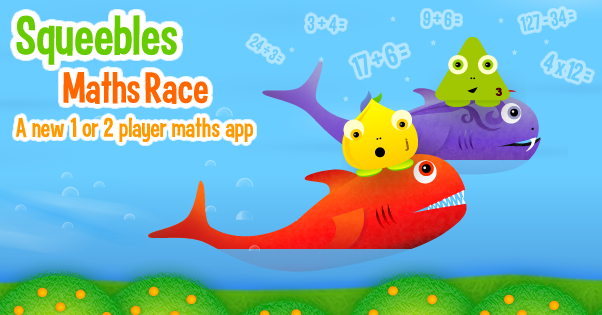 In Squeebles Maths Race, you can pick a Squeeble and a Flipfish for it to ride on and, with each question that you answer, your Flipfish will be propelled toward the finish line! And you don't have to find someone who is at exactly the same level as you are with answering mental arithmetic questions, because the app lets you set the difficulty level of the questions you're answering so that you can have a fair race against siblings or even parents! Yes, your parents can do really, really tricky subtraction questions, like 795 - 426, while you're mastering your times tables…or that could be the other way around if you're already a maths whizz!). 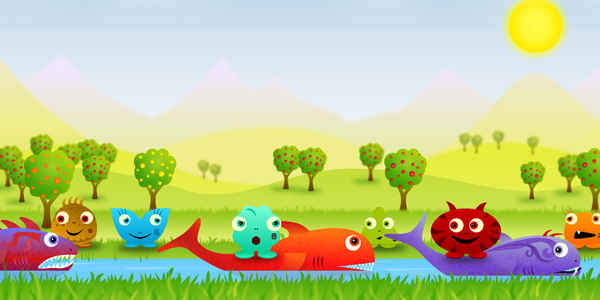 But there are probably lots of times when you might want to practise some maths questions, but don't have anyone to race against…for those times you can race against my Squeeble friends! There's Min, who is a beginner when it comes to maths - she takes a little bit longer to work things out at the moment and if you're trying to learn a new times table or work best when you're not under pressure, Min is the perfect race opponent for you…and if you don't win every time, Min will be eternally grateful. Leefee is a rookie - he's actually been putting in quite a lot of time recently with his mental arithmetic, but he's still working on building up his speed. Sav is a pro when it comes to maths - if you're feeling brave and fairly confident in your maths skills, Sav may be just the right opponent to take your mathematical racing speed up to the next level as you'll have to think quickly! Sapphire is a maths expert. Choose to race her on those days where you wake up and your brain feels sharp and ready to do some rapid mathematical somersaults, because you'll need to be on good form to win a race against her. Sal is a maths legend! 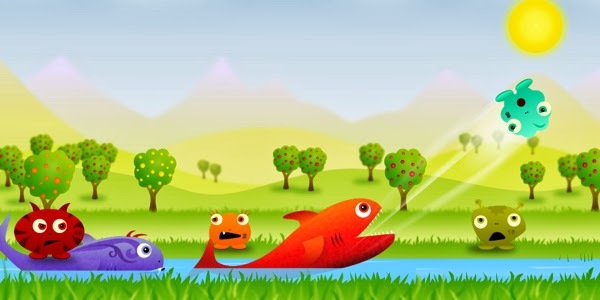 Only challenge her to a race when you're feeling particularly confident…she tends to have her Flipfish cutting through the water like it's being pulled by a jet ski as she answers questions at lightning speed! And then there's Crunch. Super Legend. If you can beat Crunch in a race, I think you have the right to call yourself a Mathematical Super Legend too. His flipfish is just a streak, a blur, a rush in the water. In fact, he travels so quickly that barely a ripple appears - it's like he was never even there! If you can beat him, I, Whizz, am in awe of your crazy maths skills. Not only will you have the fun of racing your friends, family or classmates in this app, but you'll also be awarded stars for answering questions correctly. You can save up stars and then trade them for different Squeebles and flipfish to ride on during the races! If you're interested in trying out the new app, you can ask your parent or teacher to take a look at our website for more information or suggest that they search for 'Squeebles Maths Race' in the app store! I hope you love the new app! 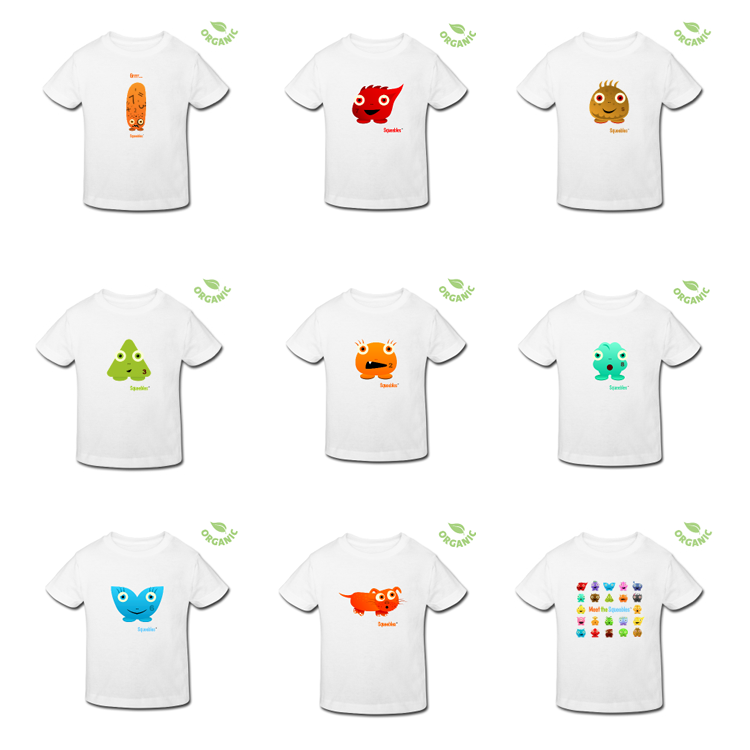 Design a Squeebles T-shirt: Win a Kindle Fire! I have two pieces of incredible news to share with you! The first is that there are now t-shirts with me and some of the other Squeebles on them! And the second, is that we want you to design a t-shirt to sit alongside these, which may be worn by Squeebles fans all over the world!!! Keep reading…there's a shiny new Kindle Fire to be won, as well as a copy of the t-shirt you've designed! You can use colouring pens or pencils, paint, collage, glitter, a computer drawing programme or whatever other medium you can think of. 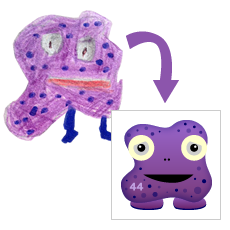 Our inventors love creating Squeebles from your drawings, and this time they're really excited about the idea of using some of your artwork to create a whole scene! We can't wait to see how it will look!!! This is the prize if you create the winning design: A Kindle Fire HD for your family or school (depending on whether it was your parent or teacher who emailed in your entry); a t-shirt showing your own digitised design; huge pride in the knowledge that your t-shirt design may be worn by Squeeble fans around the world. You have until June 13th to enter, so don't waste any time gathering together your art materials! Your parents or teachers can find out more about the terms and conditions for the competition and where to email your entries to here. Here on Squeeble Island we've been busy making up our own tongue twisters. See if you can say them aloud and then find out how many times you can repeat each one before your tongue gets in a twist. 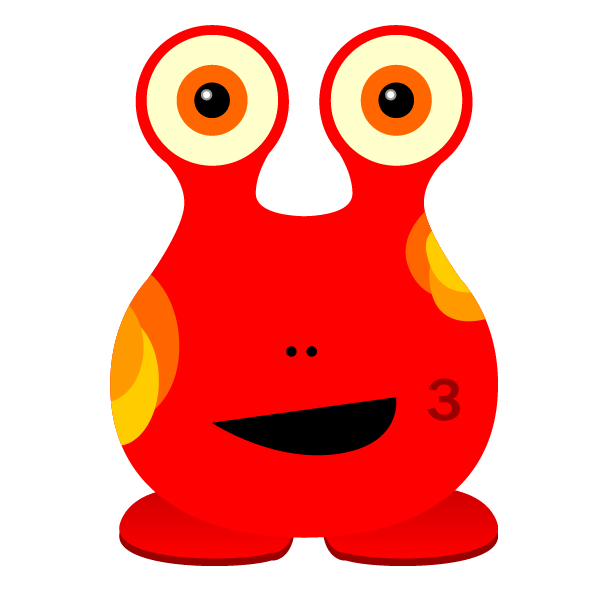 Let's begin with the one that Max made up about the Math's Monster! 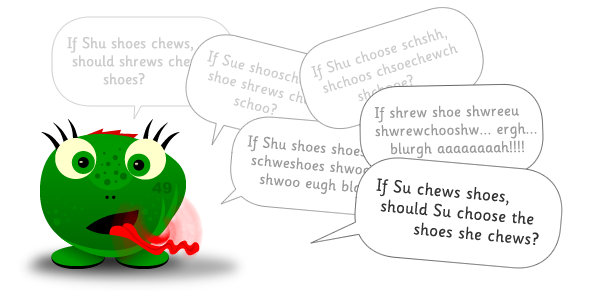 If Su chews shoes, should Su choose the shoes she chews? Flash fled from five frantic frogs who faced fifty flip-fishes, flipping fishy tails at the five frantic frogs who Flash was fleeing from. Squeebles' squeeberangs squirt squidgy, squelchy squirts of squelches straight at speeding squeeblecarts! I thought I'd tell you a story about a mystery we uncovered last summer. We'd been playing a new game in The Lake with the Flipfish and if you take a look on the Map of Squeeble Island, you'll be able to see exactly where we were. That summer, we loved racing on the Flipfish up the narrow passage of water, around 'M' Island and then back down the channel again to a finish line which was usually marked out by two Squeebles treading water (we took this in turns as it was a tiring job)! This was normally great fun, although we did get very wet: Flipfish are slippery creatures and it's a struggle to stay on the fish's back. We'd normally fall off several times in each race and the Flipfish would have to swim over to the bankside in order for us to climb back onto their backs, as it's too tricky to do this from the middle of the lake. One day Bash was riding one of the Flipfish, racing against Juju. He was having a particularly good run - he'd made it all the way up the narrow passage of the lake, then all the way around 'M' Island and was on the home strait, not too far from where Ruby and Jingo were marking out the finish line. But suddenly, when a win felt almost certain, he fell off, sliding down the side of his Flipfish like a dribble of ice-cream on a hot day. And then he was gone. We waited for Bash to bob back up, but his cloud shaped head didn't appear. A terrible silence fell over the Squeeble spectators standing on the bank and we all stared at one another. Bash's Flipfish ducked beneath the water at the spot where Bash had disappeared and what happened next was really quite terrible, although we didn't know any of this as it was happening. Only afterwards. Bash went from being lost in the water, to suddenly being trapped inside a Flipfish! He looked around. He could see the fish's insides! The bones of the Flipfish's body were outlined through walls of pink, fleshy padding and everything had a strange dark orange glow. It sounded just like it does when you put your head under the water in the bath and can hear all the normal noises swishing around, muffled and far away. There were strange things inside the Flipfish too. This is what Bash said he saw: a frying pan; something that looked like a very old sewing machine; a coat hanger; a football AND a tennis ball, which both rolled around a lot and bounced off the fish's bones; part of a sofa, a violin; and a Squeeberang that he never even knew existed! Inside the Flipfish, Bash was beginning to get really, really worried. Things were flying past him and then disappearing altogether. Bash is really, really noisy ALL THE TIME, but suddenly his voice didn't feel very loud. 'H E L P!!! ', he bellowed desperately. 'H E L P!!! 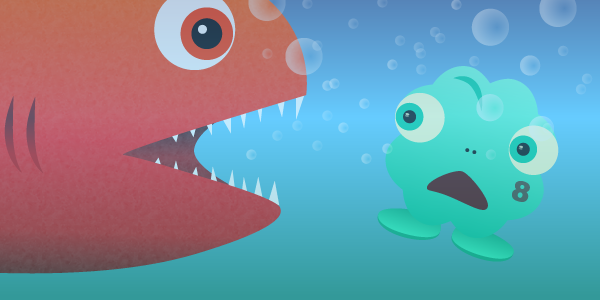 H E…..' and suddenly, before he could finish the word, he was being catapulted out of the Flipfish's body and skimming past the fish's teeth, before being shot up into the air to the rapturous applause of all the Squeebles standing on the bankside! It was a glorious sight! Bash was fine, just a bit shaken, and once he'd settled himself and was happily eating an ice-cream from Ruby's ice-cream parlour, he began to tell everyone all about his adventure. The thing that fascinated us most was the golden Squeeberang that Bash saw inside the Flipfish. 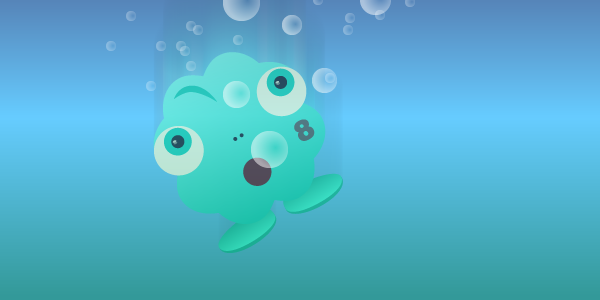 No one could ever remember losing one, or seeing one that matched Bash's description…so we had an exciting mystery on Squeeble Island and we were giddy to think that there might be a hidden Squeeberang inside every Flipfish! Based on Bash's description, our inventors later designed a Squeeberang just like the golden one that Bash saw inside the Flipfish and it's available to win in the Squeebles Spelling app! On Squeeble Island, to this day, it's still trapped inside the Flipfish, so the only time that we can ever ride on it is inside the Spelling app. Do look out for it when it comes to trading in your stars for doing well with your learning your spellings - we LOVE that Squeeberang! P.s. If you don't already use the Squeebles Spelling app, Squeeberangs are the boomerang-like gliders that we ride on in the mini-game inside the app! You might remember that last year our inventors ran a 'Design a Squeeble' competition, where the winner, Martha, was awarded the prize of having her jellylicious Squeeble, Wobble, appear in our latest app, as well as winning a shiny new iPad! The entries were so impressive, that FOUR runner up designs were also chosen to feature alongside Wobble! 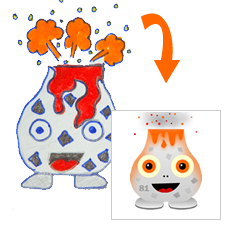 The inventors' own children obviously couldn't enter the competition, but when their son designed this squeeble called Flame, they decided that they loved him so much, that they'd make room for him in the new app too! I love seeing children's designs for new squeebles so much that I asked my inventors to give me my very own email address - you can now send me, and the other Squeebles, your drawings, stories or questions to whizz(at)meetthesqueebles(dot)com (ask a parent or teacher first though!). I'll try to feature as much of your artwork as I can here on my blog and you never know, if we really love your design, we might even try to persuade our inventors to feature him or her in a future app! Hello there everyone! I'm Whizz from the Squeebles educational apps. I'm writing this blog (which is a bit like a diary on the Internet) so that I can share some of the adventures the other Squeebles and I get up to here on Squeeble Island. 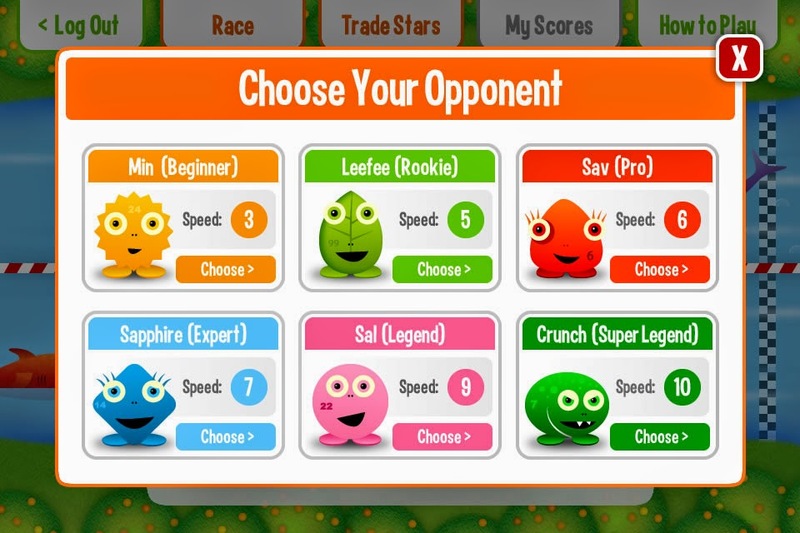 The Squeebles apps are available for iPad, iPhone, Android and Kindle Fire / Fire HD. 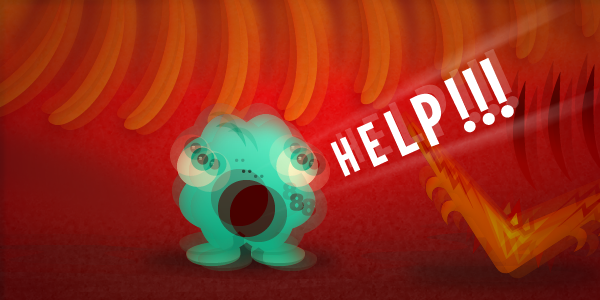 The Maths Monster has taken the Squeebles prisoner and you have to help Whizz rescue them! 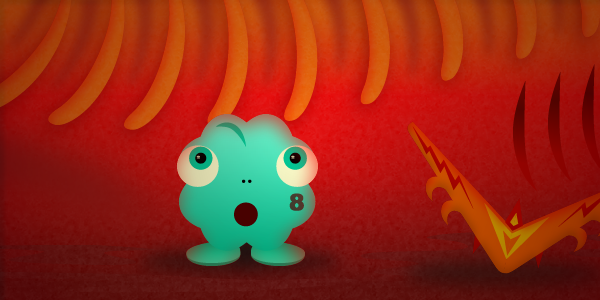 Answer spellings to earn stars and trade them for Squeeberangs to use in a fun mini-game! Help Ruby get her ice cream parlour up and running by answering maths questions correctly. Help the Squeebles win the cake baking competition with 4 fun fractions mini games. Compete in the squeeble-cart rally by answering addition and subtraction questions. 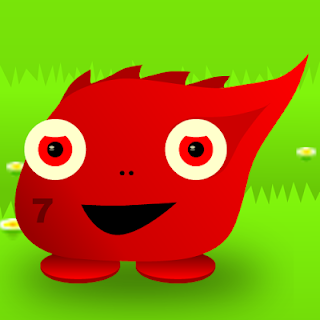 Help Whizz rescue even more Squeebles from the Maths Monster by doing your division. Bubble-Ball (1) - a type of craft a bit like a Squeeberang that a Squeeble can sit in. Used in the game Bubble-Ball and discovered accidentally by Jingo. Bubble-Ball (2) - a game the Squeebles play where a Flipfish flicks them as far as possible in a bubble-ball with its tail. Flipfish - a type of fish that lives on Squeeble Island. They love to flick Squeebles high in the air with their tails. Copyright KeyStageFun 2013. Powered by Blogger.